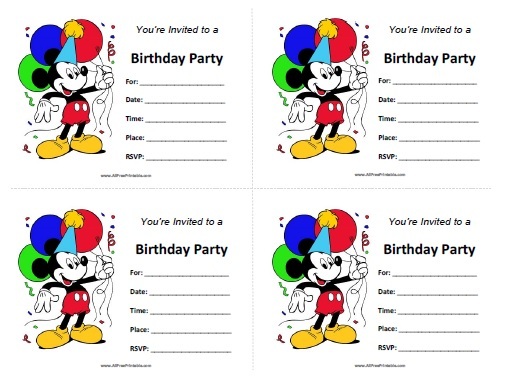 Free Printable Mickey Mouse Birthday Invitations. Free Printable Mickey Mouse Birthday Invitations, a great free printable to invite all your family, friends to the celebration and spend the money in other things you need for the birthday. You can print and use the Mickey Invitations for your next Birthday Party. Print the Mickey Mouse Birthday Invitations using your inkjet or laser printer with card paper and cut along dotted line. Then write for who is the party, date, time, place, rsvp. Includes Mickey Mouse theme with balloons and confetti. Download the Mickey Mouse Birthday Invitations template with 4 invitations per page.